There are strong indications that police officers might have been informed about the presence of armed robbers in Offa, Kwara state, before the recent robbery attack that led to the death of dozens of people. Remember that the group of at least 30 armed robbers had attacked Union Bank, Eco Bank, Guarantee Trust Bank, First Bank, Zenith Bank and Ibolo Micro Finance Bank, as well as the Owode Police Station and killed dozens on April 5, 2018. Nine police officers lost their lives in the attack. According to a report, the proprietor of Xontec Hotel on Igosun Road in Offa, Kadir Surajudeen, had called the Divisional Police Officer (DPO) of Owode Police Station to report the presence of suspected criminals that had lodged in the hotel. The report had been prompted by the discovery of some incriminating materials that had reportedly been found on the robbers while they were checking into the hotel. A source told Vanguard that when the DPO and Divisional Crime Officer (DCO) sent officers to the hotel to assess the situation, the suspects negotiated a deal and offered them the sum of N400,000. The officers reportedly returned to the station and lied that the suspects were internet fraudsters, known as Yahoo boys, and not robbers as was reported. The spokesperson of the the Kwara State Police Command, Ajayi Okasanmi, denied the allegation and questioned why Surajudeen didn’t deny the robbers lodging. Surajudeen, four members of his staff and four guests who stayed in the hotel at the time the robbers allegedly lodged in were arraigned before a Magistrate’s Court in Ilorin last week charged with two counts of criminal conspiracy and causing disappearance of evidence, including giving false information to screen an offender. The hotel staff charged along with Surajudeen are the accountant, receptionist, room keeper and clubhouse operator. The accused were unable to help investigators with useful information that could assist investigation into the crime, offences that contravened sections 97 and 167 of the Penal Code Law. The charge sheet read, “The hotel staff could not, however, satisfactorily give account of questionable lodgers in their hotel prior to the robbery by their failure to maintain or keep proper official lodger register expected to be presented to the police and other law enforcement agencies on demand. The Magistrate, M.B. Folorunso, granted the accused bail in the sum of N200,000 each with two sureties each in like sum and adjourned the case till May 3, 2018. 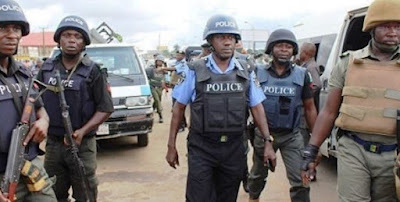 Vanguard also revealed that 12 of the suspects that are currently being interrogated in connection to the robbery were apprehended through the tracking of mobile phones the robbers collected from victims. The suspects took away the mobile phones and handed them over to their girlfriends who were later interrogated by the the police. The police interrogation led to arrests of suspects in Ibadan, Lagos and Abeokuta. At least 19 suspects have been arrested in connection to the robbery incident which sparked outrage across the country. Even though the official death toll for the incident is nine policemen and eight civilians, reports have indicated between 30 to 50 people died as a result of the attacks.